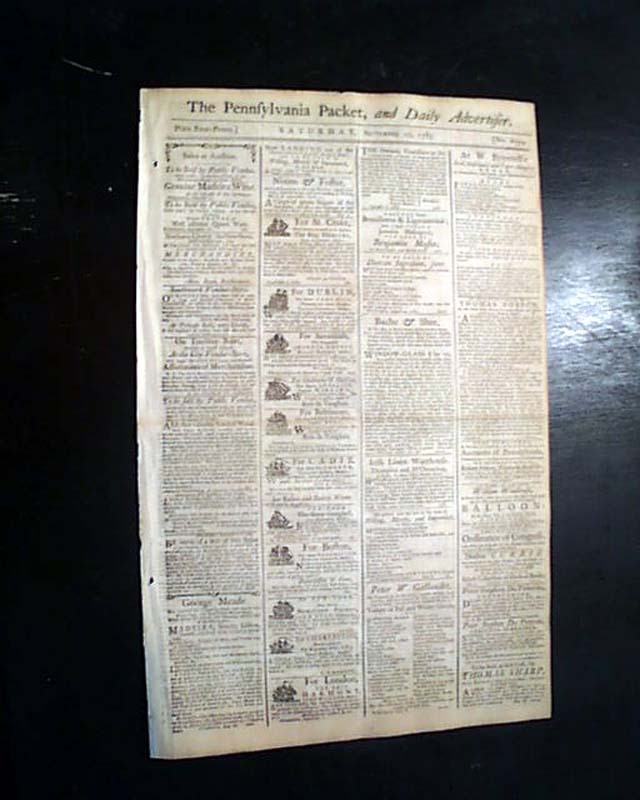 An extremely notable issue on trade with China which began in 1784. 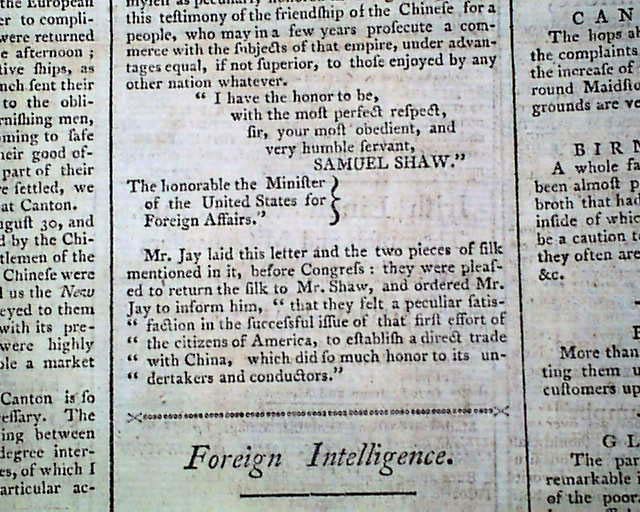 Page 2 begins with a lengthy letter signed in type by Samuel Shaw, and is prefaced with: "The following is a letter to Mr. Jay from Mr. Shaw who went in the ship Empress of China to Canton, as commercial agent for the owners. It contains an interesting and well written account of that voyage..." which indeed it does (see). 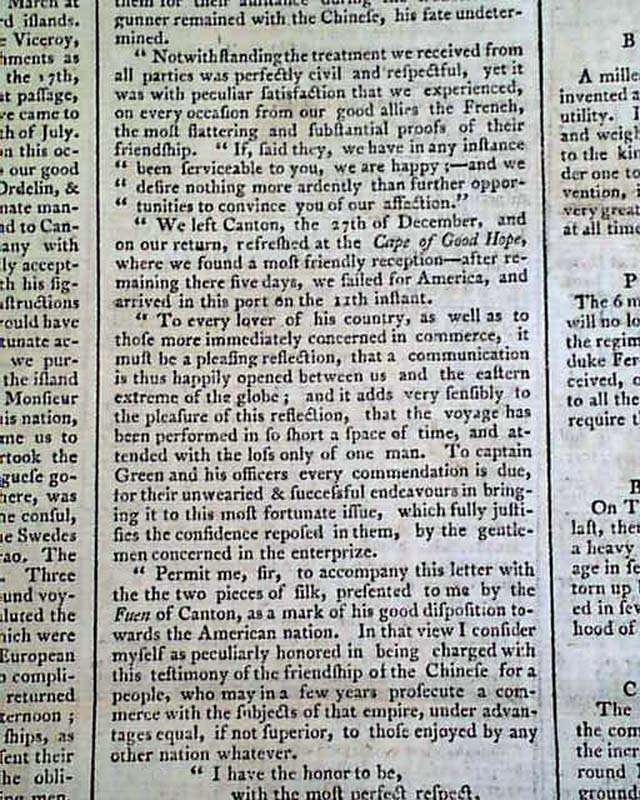 One paragraph of Shaw's letter begins: "On the 22d of February, 1784, the ship sailed from New York and arrived the 21st of March at St. Jago..." with much more on the remainder of the excursion (photos show the full text). 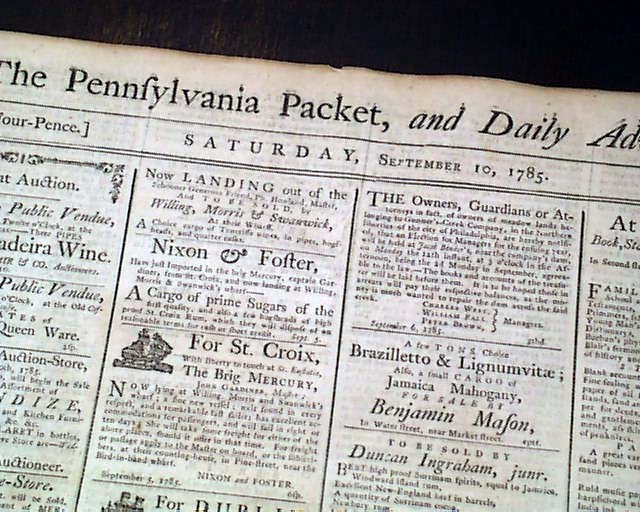 It was February, 1784. 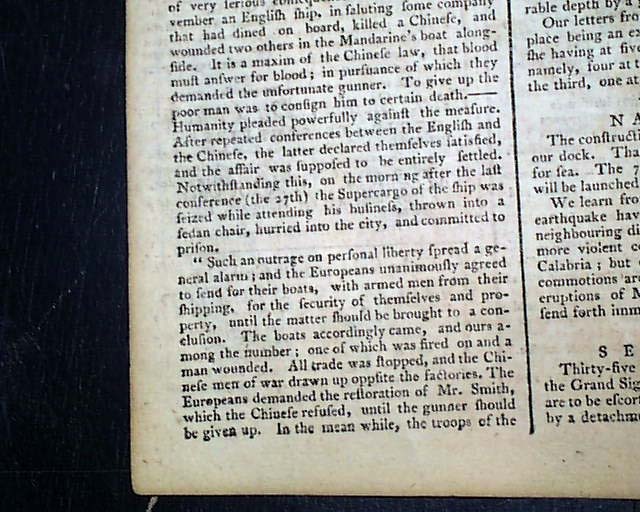 Only five months earlier, the U.S. and Great Britain signed the Treaty of Paris ending the Revolutionary War. 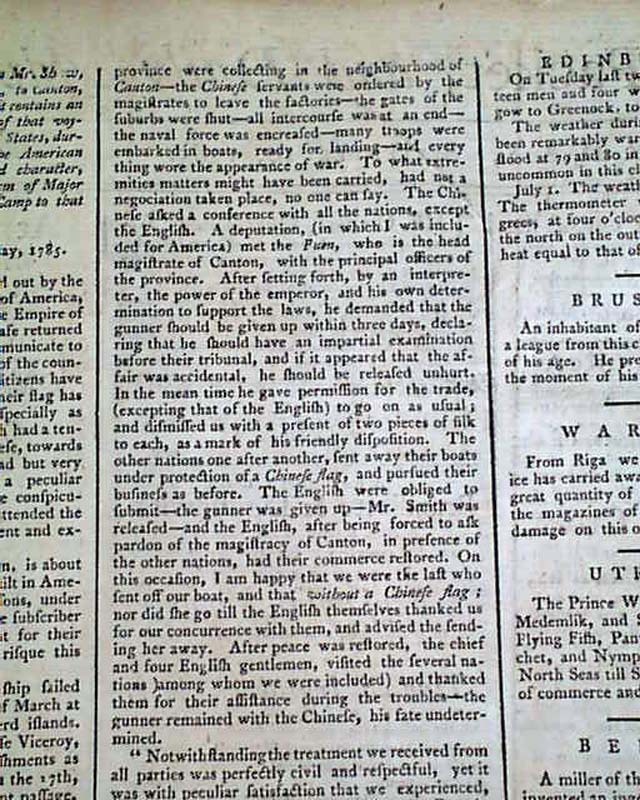 U.S. ships could no longer trade with the British West Indies & trade with other nations was in a slump. Americans especially missed tea. Robert Morris, a banker, decided to find a way to supply that tea. By doing so, he said, he hoped "to encourage others in the adventurous pursuit of commerce." Morris hired a small ship and renamed it the Empress of China. The ship was set to sail east, around the southern tip of Africa, to Canton (Guangzhou), China. The ship's captain, John Green, had spent the war attacking British cargo ships. In some ways, the most important man aboard was the "supercargo," Samuel Shaw of Boston. Shaw was a businessman, in charge of the $120,000 cargo in the ship's hold. The Empress carried lead, 2,600 animal skins, fine camel cloth, cotton, and a few barrels of pepper. It also carried 30 tons of ginseng, a root that grew wild in North America. The Chinese valued ginseng for its healing powers. 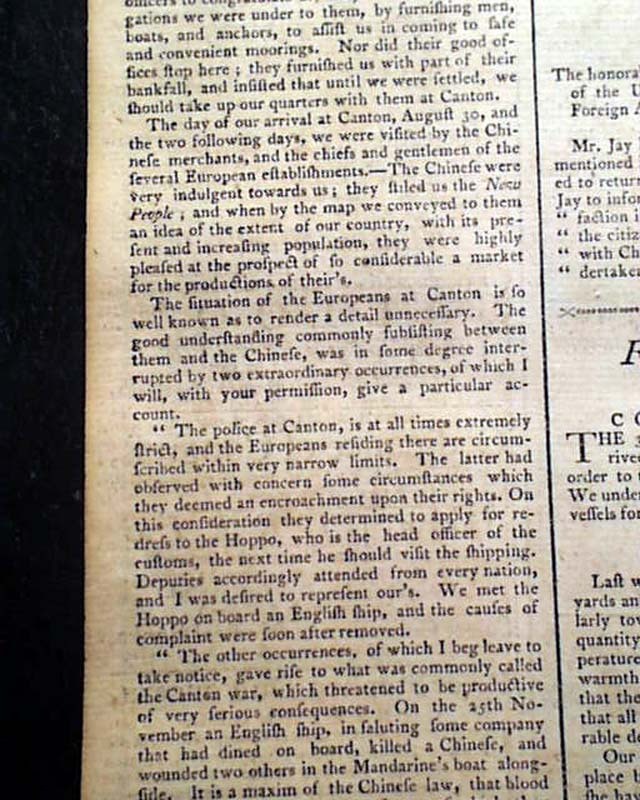 The Empress left New York harbor on February 22, 1784. 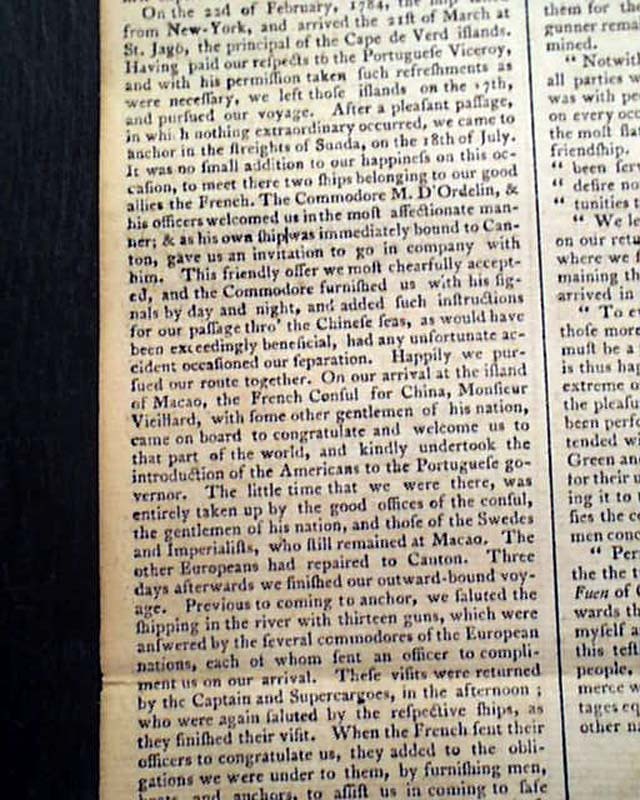 Six months later, in August, it arrived at Macao, a Portuguese outpost on the Chinese coast. Here, Captain Green hired Chinese pilots to guide his ship up the Pearl River to Whampoa. Samuel Shaw spent the next fourth months in Canton. Foreigners there weren't free to roam. The Chinese ordered them to stay in compounds where Chinese merchants called to trade. Shaw traded his cargo for tea, nankeen (Chinese cotton), tableware, silk, and spice. 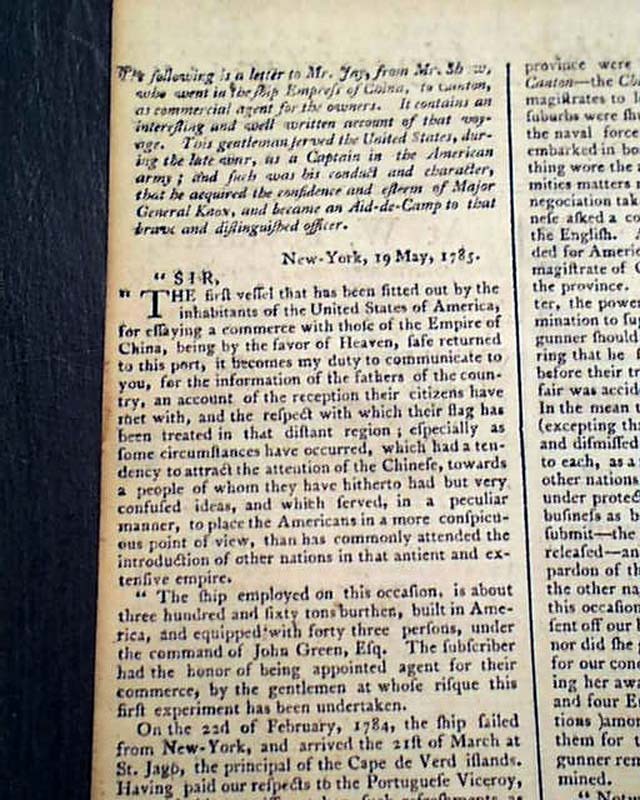 The shipment was welcomed in the U.S. when the Empress returned there in May, 1785 [note the letter in this newspaper is dated at New York, 19 May, 1785]. The Chinese goods brought Robert Morris and his partners $30,000 — an impressive profit. Other U.S. merchants would become quick to see the value of the China trade. Complete in four pages, minor archival repair at the bottom of the blank spine, very nice condition.